Dr. Daniel Levine won the 2013 Sussex International Theory Prize for his new book “Recovering International Relations,” a book about international relations theory. 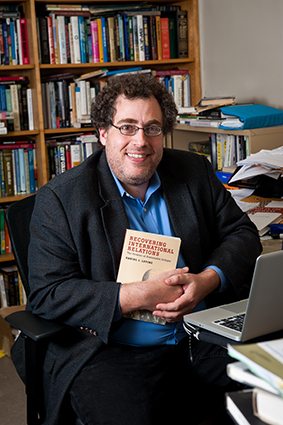 From the 2014 Celebrating Excellence | When Assistant Professor of Political Science Daniel Levine received his first copy of Recovering International Relations, a book he’d worked on for years, he couldn’t quite believe it. Merely having it in his hands – a book fueled by his former dream of working in Israeli politics and by his experiences living in Israel – satisfied him. And then the awards came. In June, Levine won the 2013 Sussex International Theory Prize, an award given annually by the University of Sussex honoring the best piece of innovative research in the field.  In November, he was named joint winner of the Yale Ferguson Award, given annually by the International Studies Association’s Northeast Region. The Ferguson award recognizes work “that most advances the vibrancy of international studies” as a discipline. The book – his first – has also received honorable mentions from two sections of the International Studies Association and a working group of the American Political Science Association, the two largest scholarly associations in his field. One of Levine’s favorite things is to hear people tell him that his book infuriated them. Part of Levine’s satisfaction comes from the process by which the book was formed. As a doctoral student in his 30s, Levine remembers locking himself away in a tiny, windowless room every day and writing with the hope that somebody would give “two hoots” when it was done. Recovering International Relations, the first of what Levine hopes will be two books, discusses the problems associated with his discipline’s conventional way of studying politics and the effects of using broad generalizations about groups of people to write policy. The second book, which Levine is just beginning, takes the unconventional approaches he proposes in his first book and tries to show how they both complicate and illuminate our understanding of the Israeli-Palestinian conflict. Levine grew up in New Jersey and was raised in what he calls a fairly traditional Jewish, middle-class, American home. He moved to Israel in 1993, a time when opportunities abounded for Americans in both the public and private sectors, and became a political analyst working for the British Embassy. His longer-term ambition was to advise senior Israli political figures. At the time, Levine – like many others – was deeply enthusiastic regarding the ongoing peace process between Israel and the Palestine Liberation Organization, or the PLO. When those negotiations collapsed, Levine’s dream collapsed too; he turned to academic study to make sense of what had happened. While in Israel, Levine served in the Israeli military. He never saw combat, yet those experiences were formative. “They made connections between physical violence and the policy process apparent in a very visceral way,” Levine said. “The experience was deeply unsettling. Violence, of course, has close links to politics, but I had largely been unaware of this. Those questions led him to study politics. He graduated with a master’s from Tel Aviv University in 2002 and a doctorate from Johns Hopkins University in 2009. Recovering International Relations is the book he wanted to write when he entered graduate school and, ultimately, the book he wrote as his dissertation, despite uncertainty as to its reception. “It’s an unconventional book for my field, and there’s a great deal of stress in writing a dissertation that’s unconventional,” he said. The book places Levine in a line of scholars who argue for the need to study politics in untraditional ways, ways that embrace the multiplicity of the human condition without making assumptions about what drives human behavior. He isn’t the only one making that argument, however. Ultimately, Levine says his goal is to infuse political science with a deep sense of responsibility: Scholars should not refrain from writing for fear that policymakers will appropriate their ideas for unintended purposes, but also to face the responsibility that follows from the possibility of that appropriation. “The people who wrote about race and nationalism in the 19th century, many of them, would never have dreamed about such ideas feeding into the genocides of the late 19th and 20th centuries, but they did,” he said. “The people who were writing about Jewish history in the early 20th century, many of them, never dreamed that the history they were writing would be used to justify racist or nationalist violence in the contemporary Middle East, but it was.